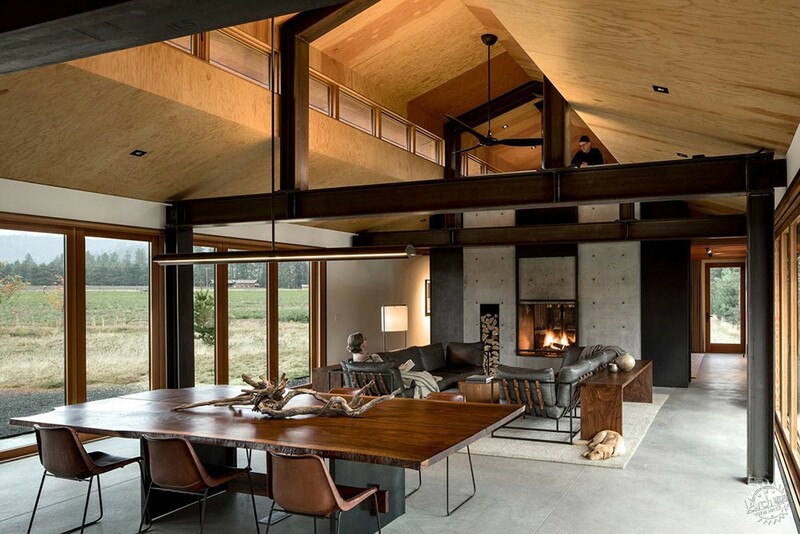 Massive bi-folding doors allow this artist's retreat in Washington by architecture firm Olson Kundig to open to the outdoors and accommodate large pieces of art. Situated in the rural area of Trout Lake, the compound is made up of four buildings arranged in two clusters. The clients, an artist couple, wanted studio spaces that would be separate from their living quarters. 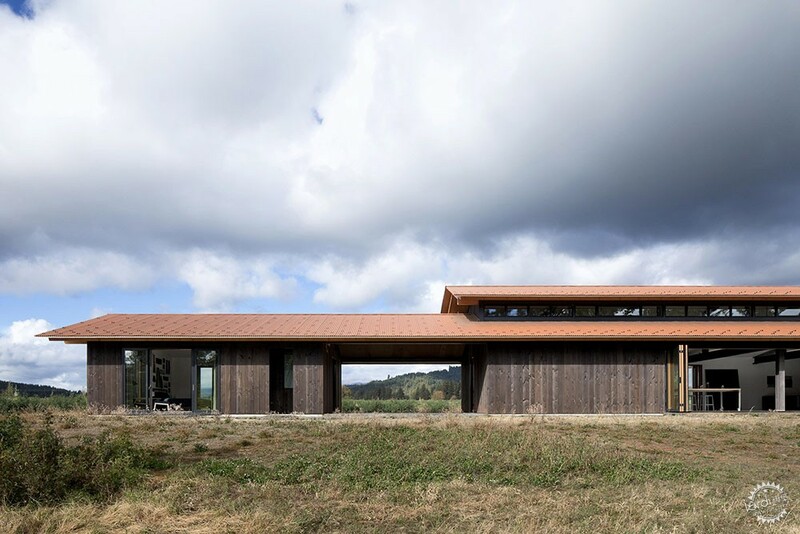 "Both owners are artists who incorporate the natural landscape into their work," said a statement from Seattle-based Olson Kundig. "He is a painter and multimedia artist, and she is a textile artist, photographer and designer." The first grouping is a T-shaped structure that comprises the main residence, work spaces, and a carport beneath the same roof. A covered courtyard connects the intersection of the three volumes. A footpath leads to the secondary building, which contains another large art studio and guest quarters. 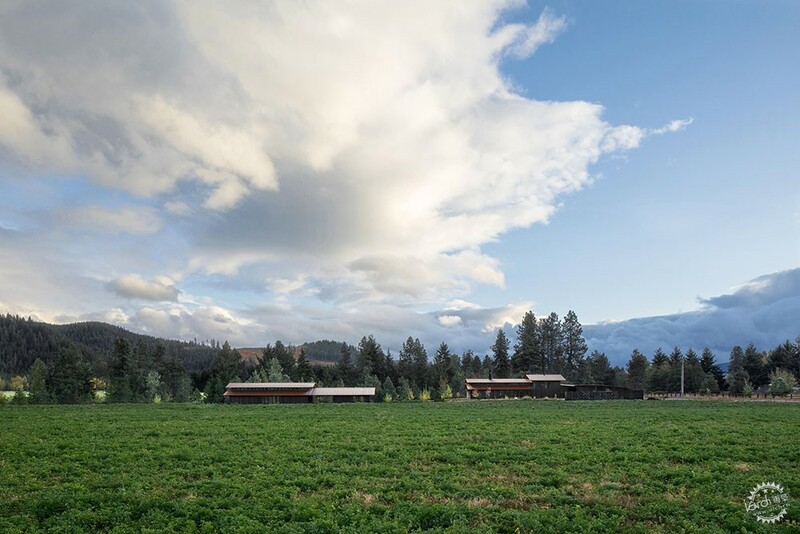 "Here, the owners work on their own projects, and occasionally host retreats and community-based art workshops," said Olson Kundig. The main residence has a single bedroom on the upper level, while the ground floor is for living spaces. The sleeping area is accessible via a staircase in the entry foyer. On the ground floor, a double-sided fireplace separates a library from the open kitchen, living and dining room. Here, expansive folding doors open out to the landscape. 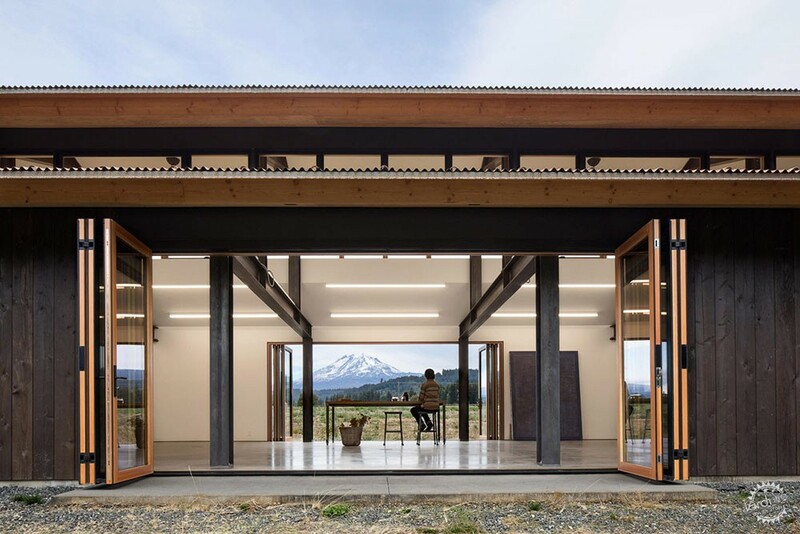 "In all four buildings, large bi-folding doors and sliding barn doors open up the spaces completely to the outdoors, allowing for the movement of large artworks and equipment, as well as an intimate connection with the environment," said the architects. In addition to these openings, a series of clerestories runs along the length of the longitudinal volume, bringing more light into the space. 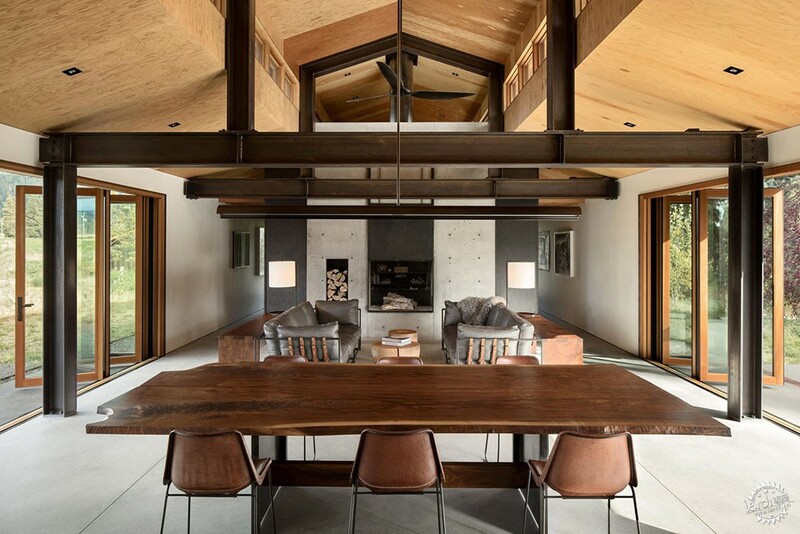 Similarly to the main home, the guest annexe draws cues from vernacular architecture. "The buildings recall the agricultural forms of the local built environment, but as is our nature in our designs, we sought to take that context and evolve it to a more emphatic modern language," said Tom Kundig, one of the firm's principals. The architects sought to use simple materials with easy upkeep. Interior finishes include polished concrete and plywood, and the building's steel structure was left exposed. Outside, dark wooden cladding covers the sides of the building, while corrugated metal is used for the roofs. The owners participated in the construction process by weathering these materials themselves. 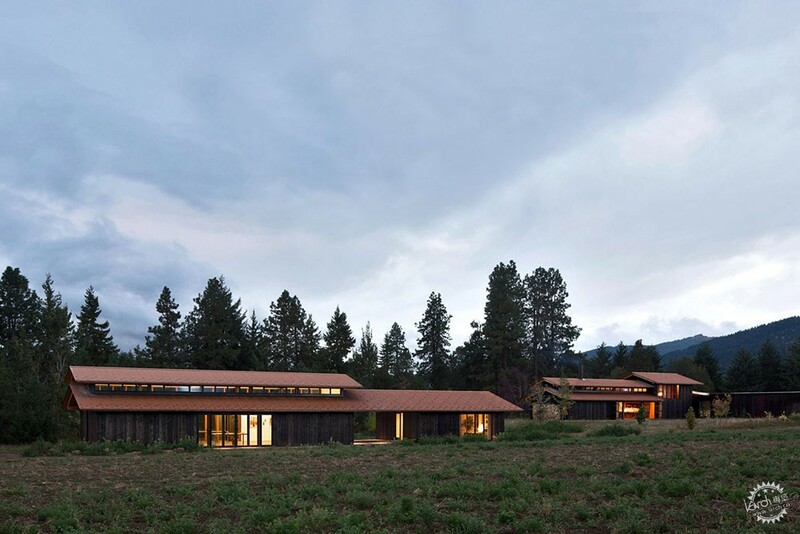 Kundig founded his firm with partner Jim Olson in 1967, and the firm has built extensively in the western United States. Other projects include a home in Idaho with several automated features, and an expansion to a tiny cabin that Jim Olson built in 1959 as an architecture student.